"Blackwater" urine due to massive hemolysis, from a patient exposed to arsine at a gas tank cleaning operation. Clinical effects of arsenic toxicity depend on the chronicity of exposure (eg, acute, chronic) and the chemical form involved, which may be inorganic arsenic (pentavalent arsenic and trivalent arsenic), organic arsenicals, or arsine gas. Frequently, patients exposed to arsenic have a garlic odor to their breath and tissue fluids. Chronic inorganic arsenic poisoning is also associated with a number of chronic medical conditions (hypertension, diabetes mellitus, and peripheral vascular disease) as well as lung, bladder, and hepatic malignancies. Skin malignancies include squamous and basal cell carcinomas and Bowen disease. Treatment of acute arsenic toxicity is supportive. Chelation therapy may be necessary in patients with inorganic arsenic poisoning. It has no role in arsine gas exposure. Arsenic, element 33, has a long and nefarious history; its very name has become synonymous with poison. In the 15th and 16th centuries, the Italian family of Borgias used arsenic as their favorite poison for political assassinations. Some even have suggested that Napoleon was poisoned by arsenic-tainted wine served to him while in exile. Arsenic is typically considered a heavy metal and shares many toxic characteristics with the other heavy metals (eg, lead, mercury). Arsenic is ubiquitous in the environment. It ranks 20th in abundance in the earth's crust, 14th in seawater, and 12th in the human body. In nature, arsenic exists in the metallic state in 3 allotropic forms (alpha or yellow, beta or black, gamma or grey) and several ionic forms. Arsenic has been used as a medicinal agent, a pigment, a pesticide, and an agent of criminal intent. In the form of chromated copper arsenate (CCA), it was once used as part of the treatment to render architectural wood immune to pest infestation. CCA was banned for use in the United States by the Environmental Protection Agency (EPA) in 2003, but a great deal of the treated wood continues to exist in the form of decks and other structures exposed to the elements. Data suggest that a significant quantity of arsenic may leach out from such wood into landfills and into the interiors of homes with existing CCA-treated decks. [5, 6, 7] Given the durability of the CCA-treated wood, such exposures may continue for decades. In the rodent model, exposure to CCA may produce significant renal pathology. Arsenic may be found as a water or food contaminant, particularly in shellfish and other seafood, and often contaminates fruits and vegetables, particularly rice. Aresenic can contaminate well water or ground water. Contamination may occur from natural sources, or from hazardous waste (eg, mine tailings). Inorganic forms of arsenic are more toxic than organic forms. The trivalent forms are more toxic and react with thiol groups, while the pentavalent forms are less toxic but uncouple oxidative phosphorylation. Very few organ systems escape the toxic effects of arsenic. Trivalent inorganic arsenic inhibits pyruvate dehydrogenase by binding to the sulfhydryl groups of dihydrolipoamide. Consequently, conversion of pyruvate to acetyl coenzyme A (CoA) is decreased, citric acid cycle activity is decreased, and production of cellular ATP is decreased. Trivalent arsenic inhibits numerous other cellular enzymes through sulfhydryl group binding. Trivalent arsenic inhibits cellular glucose uptake, gluconeogenesis, fatty acid oxidation, and further production of acetyl CoA; it also blocks the production of glutathione, which prevents cellular oxidative damage. Effects of pentavalent inorganic arsenic occur partially because of its transformation to trivalent arsenic; toxicity proceeds as outlined above. More importantly, pentavalent arsenic resembles inorganic phosphate and substitutes for phosphate in glycolytic and cellular respiration pathways. Consequently, high-energy phosphate bonds are not made, and uncoupling of oxidative phosphorylation occurs. For example, in the presence of pentavalent arsenic, adenosine diphosphate (ADP) forms ADP-arsenate instead of ATP; the high-energy phosphate bonds of ATP are lost. Arsenic is listed as a presumed carcinogenic substance based on the increased prevalence of lung and skin cancer observed in human populations with multiple exposures (primarily through industrial inhalation). Worldwide, up to 100 million people are at risk of exposure to unacceptable arsenic levels in either well water or ground water. Numerous "outbreaks" of excessive arsenic in water and food from an assortment of natural and anthropological causes have occurred. In Bangladesh, more than 95% of the water supply to over 138 million people is potentially arsenic contaminated at levels exceeding the US EPA and WHO action limits. [14, 15] If international efforts at elimination of the risk are unsuccessful, it is estimated that a substantial proportion of the Bangladesh population will develop arsenic-related diseases such as pulmonary and skin cancers as well as cardiovascular and renal disease. Emadi A, Gore SD. Arsenic trioxide - An old drug rediscovered. Blood Rev. 2010 Jul-Sep. 24(4-5):191-9. [Medline]. [Full Text]. Lo-Coco F, Cicconi L, Breccia M. Current standard treatment of adult acute promyelocytic leukaemia. Br J Haematol. 2016 Mar. 172 (6):841-54. [Medline]. 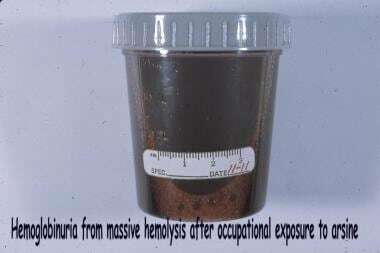 Gensheimer KF, Rea V, Mills DA, Montagna CP, Simone K. Arsenic poisoning caused by intentional contamination of coffee at a church gathering--an epidemiological approach to a forensic investigation. J Forensic Sci. 2010 Jul. 55(4):1116-9. [Medline]. [Full Text]. Sigmon C, Patch S. A pilot survey of in-service home arsenic tracked in from chromated copper arsenate-treated decks. J Environ Health. 2010 Jan-Feb. 72(6):18-22. [Medline]. Matos RC, Vieira C, Morais S, Pereira ML, Pedrosa J. Toxicity of chromated copper arsenate: a study in mice. Environ Res. 2010 Jul. 110(5):424-7. [Medline]. Kamchanawong S, Veerakajohnsak C. Arsenic, chromium, and copper leaching from CCA-treated wood and their potential impacts on landfill leachate in a tropical country. Environ Technol. 2010 Apr 1. 31(4):381-94. [Medline]. Luna AL, Acosta-Saavedra LC, Lopez-Carrillo L, Conde P, Vera E, De Vizcaya-Ruiz A, et al. Arsenic alters monocyte superoxide anion and nitric oxide production in environmentally exposed children. Toxicol Appl Pharmacol. 2010 Jun 1. 245(2):244-51. [Medline]. Raghu KG, Yadav GK, Singh R, Prathapan A, Sharma S, Bhadauria S. Evaluation of adverse cardiac effects induced by arsenic trioxide, a potent anti-APL drug. J Environ Pathol Toxicol Oncol. 2009. 28(3):241-52. [Medline]. Balakumar P, Kaur J. Arsenic exposure and cardiovascular disorders: an overview. Cardiovasc Toxicol. 2009 Dec. 9(4):169-76. [Medline]. Moon KA, Guallar E, Umans JG, Devereux RB, Best LG, Francesconi KA, et al. Association Between Exposure to Low to Moderate Arsenic Levels and Incident Cardiovascular Disease: A Prospective Cohort Study. Ann Intern Med. 2013 Sep 24. [Medline]. Grau-Perez M, Kuo CC, Gribble MO, Balakrishnan P, Jones Spratlen M, Vaidya D, et al. Association of Low-Moderate Arsenic Exposure and Arsenic Metabolism with Incident Diabetes and Insulin Resistance in the Strong Heart Family Study. Environ Health Perspect. 2017 Dec 20. 125 (12):127004. [Medline]. [Full Text]. Ng JC, Moore MR. Arsenic in drinking water: a natural killer in Bangladesh and beyond. An urgent alternative watershed management strategy is needed. Med J Aust. 2005 Dec 5-19. 183(11-12):562-3. [Medline]. [Full Text]. Rodrigues EG, Bellinger DC, Valeri L, Hasan MO, Quamruzzaman Q, Golam M, et al. Neurodevelopmental outcomes among 2- to 3-year-old children in Bangladesh with elevated blood lead and exposure to arsenic and manganese in drinking water. Environ Health. 2016 Mar 12. 15:44. [Medline]. Zablotska LB, Chen Y, Graziano JH, Parvez F, van Geen A, Howe GR, et al. Protective effects of B vitamins and antioxidants on the risk of arsenic-related skin lesions in Bangladesh. Environ Health Perspect. 2008 Aug. 116(8):1056-62. [Medline]. Gong G, O'bryant SE. The Arsenic Exposure Hypothesis for Alzheimer Disease. Alzheimer Dis Assoc Disord. 2010 May 13. [Medline]. Ettinger AS, Zota AR, Amarasiriwardena CJ, Hopkins MR, Schwartz J, Hu H, et al. Maternal arsenic exposure and impaired glucose tolerance during pregnancy. Environ Health Perspect. 2009 Jul. 117(7):1059-64. [Medline]. [Full Text]. Vahter M. Effects of Arsenic on Maternal and fetal Health. Annu Rev Nutr. June 2009. 29:381-399. [Medline]. [Full Text]. Yoshimura Y, Endo Y, Shimoda Y, Yamanaka K, Endo G. Acute Arsine Poiosning Confirmed by Speciation Analysis of Arsenic Compounds in the Plasma and urine by HPLC-ICP-MS. J Occupational Health. Nov 2011. 53:45-49. [Medline]. [Full Text]. Robert B. Saper, Russell S. Phillips, Anusha Sehgal, Nadia Khouri, Roger B. Davis, Janet Paquin, et al. Lead, Mercury, and Arsenic in US- and Indian-Manufactured Ayurvedic Medicines Sold via the Internet. JAMA. 2008. 300:915-923. [Full Text]. Navarro B, Sayas MJ, Atienza A, Leon P. An unhappily married man with thick soles. Lancet. 1996 Jun 8. 347(9015):1596. [Medline]. Hackenmueller SA, Strathmann FG. Total arsenic screening prior to fractionation enhances clinical utility and test utilization in the assessment of arsenic toxicity. Am J Clin Pathol. 2014 Aug. 142 (2):184-9. [Medline]. [Full Text]. Kosnett MJ. The role of chelation in the treatment of arsenic and mercury poisoning. J Med Toxicol. 2013 Dec. 9 (4):347-54. [Medline]. [Full Text]. Muckter H, Liebl B, Reichl FX, et al. Are we ready to replace dimercaprol (BAL) as an arsenic antidote?. Hum Exp Toxicol. 1997 Aug. 16(8):460-5. [Medline]. Andersen O, Aaseth J. A review of pitfalls and progress in chelation treatment of metal poisonings. J Trace Elem Med Biol. 2016 Dec. 38:74-80. [Medline]. Amster E, Tiwary A, Schenker MB. Case report: potential arsenic toxicosis secondary to herbal kelp supplement. Environ Health Perspect. 2007 Apr. 115(4):606-8. [Medline]. Borak J, Hosgood HD. Seafood arsenic: implications for human risk assessment. Regul Toxicol Pharmacol. 2007 Mar. 47(2):204-12. [Medline]. Duenas-Laita A, Perez-Miranda M, Gonzalez-Lopez MA, et al. Acute arsenic poisoning. Lancet. 2005 Jun 4-10. 365(9475):1982. [Medline]. Fesmire FM, Schauben JL, Roberge RJ. Survival following massive arsenic ingestion. Am J Emerg Med. 1988 Nov. 6(6):602-6. [Medline]. Gerhardt RE, Crecelius EA, Hudson JB. Moonshine-related arsenic poisoning. Arch Intern Med. 1980 Feb. 140(2):211-3. [Medline]. Graeme KA, Pollack CV Jr. Heavy metal toxicity, Part I: arsenic and mercury. J Emerg Med. 1998 Jan-Feb. 16(1):45-56. [Medline]. Hall JC, Harruff R. Fatal cardiac arrhythmia in a patient with interstitial myocarditis related to chronic arsenic poisoning. South Med J. 1989 Dec. 82(12):1557-60. [Medline]. Lai MW, Boyer EW, Kleinman ME, et al. Acute arsenic poisoning in two siblings. Pediatrics. 2005 Jul. 116(1):249-57. [Medline]. Lech T, Trela F. Massive acute arsenic poisonings. Forensic Sci Int. 2005 Jul 16. 151(2-3):273-7. [Medline].